IMPORTANT NOTICE: Our software ONLY WORKS with Microsoft Excel and Microsoft Powerpoint, on a Microsoft operating system. Over the course of the last two years, I have met many self-published authors, who are making 4- to 5-figures per month, publishing simple journals and planners. Most publish simple books in great variety. The level of success they experience is often comparable to the amount of variety they are willing to offer consumers. Providing consumers more purchase options has been beneficial to their business. Book sales & royalties climbed in proportion to the number of books they had available for purchase. Instead of investing a lot of effort into turning individual books into national best sellers, self-published journal and planner authors focus on the basics of creating more books that can be found in a wider variety of sub-categories on Amazon’s website. They have decided it is easier and more profitable to produce a larger variety of books, instead of spending time and money to market and promote single book titles. They rarely make changes to a book once it has been published. They tend to make more money when they publish more books. They have found that the easiest way to increase their book royalties is to figure out how to create more books in less time. In a Lot Less Time & Without the Steep Learning Curve? 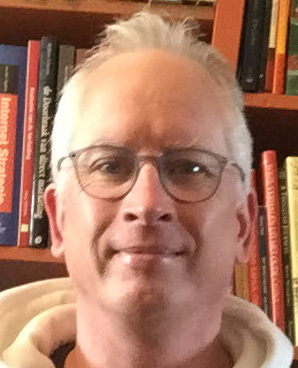 As you may already be aware, I am a computer nerd, with almost two decades experience working with business software and the more-advanced visual design software. Even with all of my personal experience, I found the process to carry a steep learning curve. In the early stages of my “1,000 books in 2018” personal challenge, I was only publishing five (5) books a day – most being journals, with a few planners tossed into the mix. Even with my advanced knowledge on the subject, production remained quite low. My biggest advantage was my commitment to the task, and the self-control necessary to meet my stated goals on a daily basis. It wasn’t until I discovered some of the more advanced functions inside the software applications I was using that I was able to step up my production. Even though I was able to jump from five new books published each day, to dozens of books published every day, I still had many lengthy processes that I had to complete in order to achieve my goals. In 2018, I discovered that using Powerpoint was far easier than using Word to create a book manuscript. This is where I started my journey, because I wanted to find a way for other people to be able publish journals and planners quickly, without the steep learning curve and high-level of frustration they had experienced previously. I wanted to give novice journal authors the ability to get into the game and get on the sales charts as quickly as possible. I wanted to be able to invite people to participate in the “2019 version of the 1,000 book challenge,” then I wanted to give them the ability to get there in just 30 days if they were so inclined to do so. Make the entire process easier to understand. Erase the need for expensive visual design software. Eliminate a lot of the frustration. Give people confidence in their new skills. Teach people how to use automation to speed the processes involved. A couple months ago, I released a training called “Journal Accelerator” to show people how to use the automation tools inside of Microsoft Word to create journals rather quickly. I was hoping to teach people how to use the exact same automation processes I used in Microsoft Word, but this time to employ those automation processes inside of Microsoft Powerpoint. Microsoft has a different world view than I have. Powerpoint does not contain the automation tools that Microsoft Word has available inside of it. To be honest, I was literally dumbfounded about where to go with this. Powerpoint is such a useful tool and a very easy-to-use application for self-published authors. A few days after I hit the brick wall with Powerpoint, I was having a conversation with my programmer friend. I shared with him my frustration that Microsoft does not have the same automation tools inside Powerpoint as it has in Word. And with those words, he saved my bacon on this project. = Oh My Gosh, This Is So Awesome! With our “Powerpoint Replicator” software, we have taken what used to be a frustrating and lengthy manual process, and we turned it into a simple “Fill-In-The-Blank” process. The Cover Template will automatically load with all margins, bleeds and measurements that meet Amazon’s requirement for the book size you choose. The Page Template will be automatically formatted with accurate margins and gutters, for your chosen book size, according to the measurements that Amazon recommends. For the Cover Creator, you would need to load the paths for your book cover backgrounds, title and author name into your Excel Spreadsheet. For the Page Creator, you would need to load the values that you would like to customize inside your books. Select the Powerpoint Template created in the first step. Select the Excel Spreadsheet created in the second step. 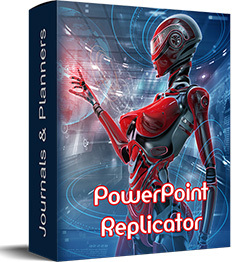 Replicate – This process will create your book cover files or your book manuscript files. As you can see, we have taken what was once a very frustrating, detailed and time-consuming process, and we have compressed the entire process to just six steps! A quick read through the “PowerPoint Replicator” instructions with lots of screenshots to explain finer points gave me the confidence to try it. Each step was clearly explained. I took my time over it, knowing that Di Heuser was at the end of an email if I got stuck. It felt like several intricate steps but they weren’t really – they had to be intricate to explain exactly why an action was taken, e.g. adding % at the beginning and end of field names. As one of the world’s least organised people, this got me organised. Make a list of template names so you know what template name goes in which field on the actual replicator spreadsheet. I was gobsmacked at how easy it was to use and to have two planner covers ready to use in seconds. Not being a PS fan, I thought that single pattern planner covers were beyond me. Thanks to Di Heuser and the “PowerPoint Replicator”, I can use one pattern on my front cover instead of having an image of the pattern stuck in the middle of a plain cover. Wow!!! This piece of kit will be a game-changer for me. My highest upload figure in a day has been 10. Today my target is 100! We built this software on top of Microsoft Excel, to work also with Microsoft Powerpoint, on a Microsoft Windows operating system. We can only guarantee that this software will work with the Microsoft Office suite of office tools on Microsoft Windows. We have fully tested this software with Microsoft Windows operating systems, using Microsoft Excel and Microsoft Powerpoint. The software works exactly as designed and described. We know our software WILL NOT work with Mac operating systems. We also know that our software WILL NOT WORK with Libre Office or Open Office. Q1: Why aren’t you offering a refund on this offer? Don’t you believe in your product? A1: We do believe in our product. We also know that if you are using Microsoft Windows with the Microsoft Office product, then you will have no problems with the software operating exactly as described. We have demonstrated how the software works in text format, image format, and video format. If you are unsure about your purchase of this software, then please don’t make a purchase today. Q2: What if I want to take my chances using your software with Libre Office or Open Office? A2: You will be wasting your money. It is not even possible for our software to work with Libre Office or Open Office. Q3: What will I receive in the delivery file? Two (2) PDF files – Instructional PDF and a Cheat Sheet PDF. Two (2) XLSM files – One creates the Powerpoint Templates. The other generates the Covers and Pages from the Excel Spreadsheet. Two (2) Sample PPT files – Sample Powerpoint files. Q4: Are there any up-sells? “Powerpoint Calendar Creator” ($37) – Software to create custom calendars for your books, using the same principle of “Fill in the Blanks” as demonstrated with the “Powerpoint Replicator” software. “Powerpoint Graphics & Templates” ($27) – Contains 25 PPT Templates created by Sue Fleckenstein. 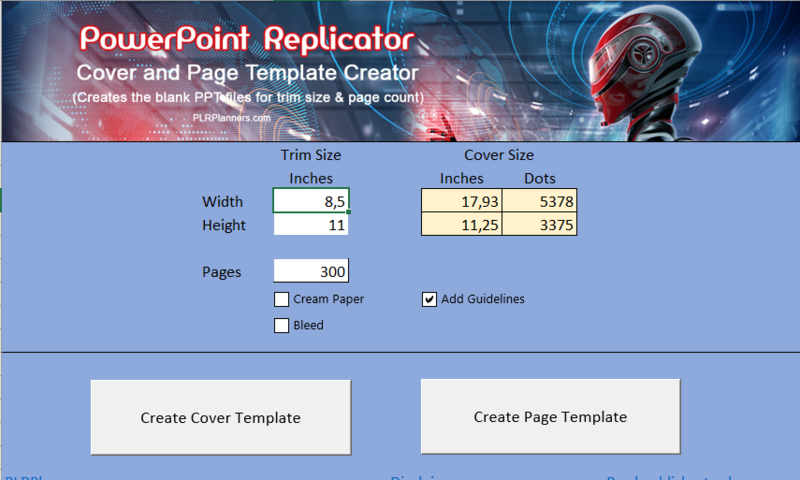 All of Sue’s templates were designed to work specifically with the “Powerpoint Replicator” software. This package also contains 100 PNG Graphics with Commercial Use Rights. Q5: Are you planning on doing updates to the software in the future? A5: We are not planning on it, but we are not ruling it out either. Microsoft occasionally does updates that might impact this software. If that were to happen, we will do a software update. If we decide there might be a better way to do a particular part of the process, we may update the software for that purpose as well. Q6: What if I have questions that haven’t yet been answered? After you make your purchase, you will be sent access to a PDF file that contains links to: Two (2) XLSM files, two (2) PPT sample files, and two (2) PDF files, as described in the FAQ #3. Thank you for your interest in our “Powerpoint Replicator” software.